The wine is bright crystal in appearance and displays a fine and elongated bead. It has a powerful, fruit driven nose with floral and mineral overtones derived from the Chardonnay component. The palate has a high-noted start with subtle richness and distinguished mid-palate texture leading to a long and fresh finish. 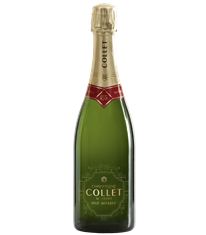 Collet Art Déco is a superb aperitif and suits refined gourmet occasions, pairing ideally with seafood, and a range of Mediterranean and Japanese dishes.